Justin Hoekman receives his award from Col. Tim Hahn on Oct. 24 in Las Vegas. 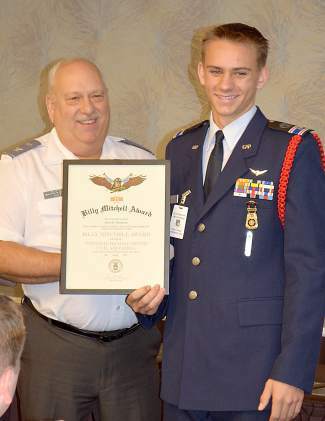 TRUCKEE, Calif. — On Oct. 24, Justin Hoekman received his Mitchell Award at the yearly Nevada Wing conference in Las Vegas by the outgoing commander of the Nevada Wing section of the Civil Air Patrol, Col. Tim Hahn. The Mitchell Award is a significant award for cadets; it is a stepping stone for moving the cadet into an officer role. The award is one of the most prestigious cadet honors. Cadets who earn the Mitchell Award have completed Phase 2 of the CAP Cadet Program, earning half of the 16 achievements needed in order to receive the Spaatz Award — the highest rank for cadets in CAP. To earn the Mitchell Award, cadets must pass comprehensive leadership and aerospace exams, as well as a rigorous physical fitness test, and they must attend encampment and demonstrate leadership skills by leading the cadet squadron. The Mitchell Award is named for Billy Mitchell, who is remembered for his vision of an independent air force, for his prediction of an enemy bombing of Pearl Harbor, and for his successful command of bombing runs. Lt. Erin LeFevers is Deputy Commander of Cadets for the Tahoe-Truckee Composite Squadron of the Civil Air Patrol. Email her at elefevers@hotmail.com, or visit cap-ttcs.org to learn more.